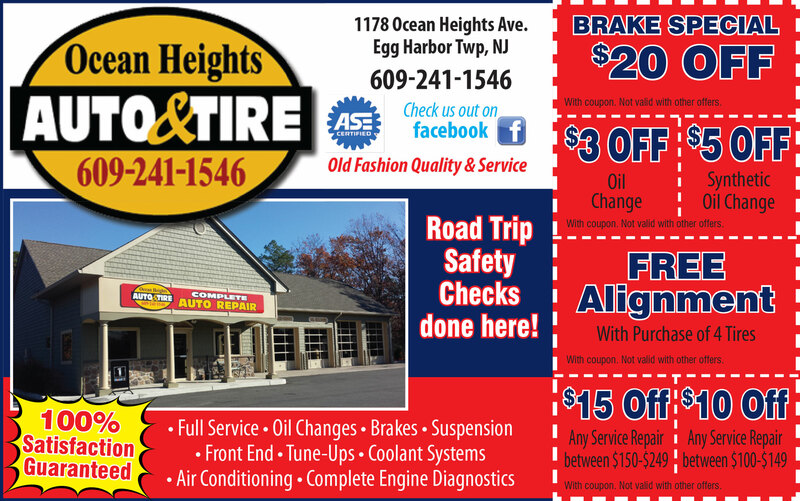 Ocean Heights Auto & Tire is an auto repair shop in Egg Harbor Township, NJ. We can take care of everything your vehicle needs, whether it's an oil change, new tires, a regular tune-up or a variety of other services! Ocean Heights is a family-owned business that focuses on providing impeccable customer service and affordable auto repairs. Come in and see our shop! For real time updates, be sure to follow us on Facebook and Twitter as well. In addition to Egg Harbor Township, we serve Mays Landing and Linwood, NJ residents for all their automotive needs! We appreciate your interest in Ocean Heights and look forward to working with you and your car soon! Ocean Heights is a full-service auto repair shop. No matter the problem, our ASE certified mechanics will treat your car like their own, providing only the best service. Whether you're looking for new tires, a quick oil change or your vehicle is malfunctioning and you're not sure what's wrong, our team is up for the job! Copyright © 2019 OCEAN HEIGHTS AUTO & TIRE, all rights reserved.